I read an excellent series of articles recently about the Diagnostic Imagination in Radiology by Rodney Sappington, PhD. 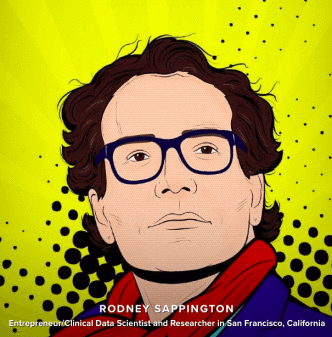 Rodney W. Sappington, PhD is a senior clinical data scientist, informatician, author, and healthcare strategist. He is CEO of Acesio Inc., a disease insights company that leverages medical and non-medical data to better understand early indicators and inequities that lead to global disease incidence. He can be contacted at RodneyS@sappington-associates.com. The final part in this series addresses the impact of machine learning on jobs and expertise in radiology service. Machine intelligence automation is a complex picture. There are trends moving in opposite directions. One direction represents job reductions, another direction represents expanding opportunities and new types of jobs. Computerization and machine intelligence together reallocate rather than displace jobs. The skills required to do and carry out diagnostic image interpretation will change rather than be replaced. Dr. Sappington writes, “This final article in the series on the diagnostic imagination will examine job loss and shifting professional expertise in radiology. As a set of deployments, machine intelligence not only has a technical impact but social and economic implication. Diagnostic expertise has been taught to radiologists for generations as a decade long right-of-passage based on extensive medical education and residency training. Radiologists have been trained to think of themselves at the center of pathology, anatomical, and functional diagnostic orders. Their expertise (and cognitive and perceptual pattern recognition) is developed over years. What’s been called the “The Fourth Industrial Revolution” by the World Economic Forum, challenges these medical training times and approaches.1 This socio-economic shift affects radiology but also the larger global economy. Machine learning, advanced robotics, and biotech are some of the fields disrupting old lines of employment. In this revolution we’re seeing the time horizon shrink between training and employment and adapting to new skills. As the World Economic Forum states, 65% of our children starting first grade today will end up working in new job types that don’t yet exist.2 This accelerated training-to-employment cycle puts enormous pressure on planning for how jobs will shift, emerge, and disappear not tomorrow but next month, next year. Between 2015-2020 it’s estimated that there will be a “total loss of 7.1 million jobs – two thirds of which are concentrated in routine white collar office functions, such as office and administrative roles – and a total gain of 2 million jobs, in computer and mathematical and architecture and engineering related fields.” 2 In economic parlance, this global disruptive labor market change and churn between job families and functions has significant import upon radiology. Such features of radiology make it prone to disruption and job churn due to its fully digitized, networked, uses of Big Data, teleradiology, and under-realized application of real-time image analyses at the point of diagnostic interpretation. Healthcare will be hit hard across specialties and organizations with automation, in part, due to machine intelligence but also changing demographics, market consolidation, and still unforeseen but volatile public-private reimbursement structures. Radiology may be hit harder due to the digital maturity of its image archives, image compression, and cloud-based distributed services. As seen in Figure 1, we can begin to place healthcare in this global perspective of labor markets and jobs by industry. 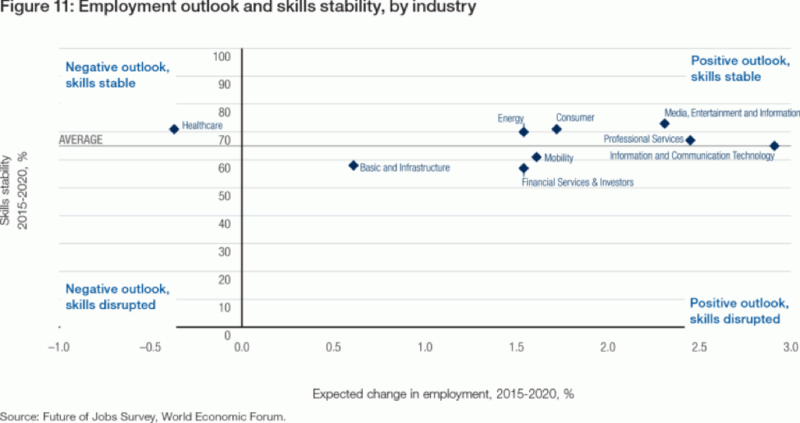 The graph locates healthcare among other industries undergoing rapid change from machine intelligence in two respects: healthcare skills are the most likely to be disrupted among all industries and yet healthcare will retain some skill stability into 2020. This tension will continue beyond 2020. The number one barrier to leveraging machine intelligence for optimal clinical benefit and job creation, cites the World Economic Forum report is insufficient understanding of disruptive changes. That is, healthcare may be particularly resistant to such proactive understanding due to a recalcitrant and complex payment mix, insular hospital competition, and medical science resistant to change. One of the key features of the American Dream is how we compare our standard of living to our parents. In economic terms this is measured as absolute income mobility. Those who are upwardly mobile have fallen sharply over several decades. “Rates of absolute mobility have fallen from approximately 90% for children born in 1940 to 50% for children born in the 1980s.” As digital technologies have advanced and globalization has taken hold across industries the economic pie has become increasingly less distributed. There are fewer winners in the middle and lower economic areas of the US economy. People are reaching up, but there are fewer brass rings to latch on to. If we were to drive up GDP mobility would not change. Real change lies in “the distribution of growth across income groups.” What this means is that growing GDP by itself does not revive the “American Dream” for subsequent generations, instead economic growth must be “spread more broadly across the income distribution.” In short, to climb up the economic ladder requires a more equitable distribution of wealth not just a wealthier country for the few. We are placing machine intelligence on top of an American Dream of haves and have-nots. When we look at radiology we see a microcosm of this larger economic mobility scenario with an annual radiologist income above $300,000 and job growth over 15% over 10 years.3 However, radiologists are experiencing wage fracturing due to the piece working interpretation services. Radiologists have benefited from flexible work hours and cloud-based digital interpretation systems. However, what was once one job and one income can now be several teleradiology jobs being cobbled together to achieve a similar income. This can be inefficient, operationally exhausting for an individual radiologist and opens the radiologist to ongoing contract and credentialing administration not to mention diagnostic error. Another threat to radiology jobs is the very thing that radiologists have claimed with pride: their lengthy and intellectually demanding training. Machine learning and data science is moving much faster in providing guidance to identifying clinical features in CT, MRI, and plain film. We have already reached beyond human performance in identifying muscular skeletal disorders, early signs of breast cancer, and are making strides in lung cancer. The phrase “beyond human performance” does not necessarily point to moving beyond the radiologist, but instead to adding value through reduction of radiologic error. One study noted identified, through examples, four strategies for reporting that added value through reduction of radiologic error, helping to mitigate the 12.4% clinically significant error rate found in reinterpretation of outside studies.4 What this means is that training algorithms and training radiologists to be good at pattern recognition are on entirely different time lines. Radiologists require a decade, but once automated cloud-based machine learning platforms are further perfected (eg, Google’s TensorFlow, Amazon’s AWS, Microsoft’s Azure, IBM Watson) such algorithms will be trained and tested in a day or week, faster than humans can be medically trained. The notion of training to reduce medical error and gain efficiency will increasingly fall upon new sets of skills across data science, machine learning, automating workflows, and clinical judgement. With daily announcements that AI will be reducing millions of jobs in the near term, we should pay attention to these realities that in some cases predate such technological shifts but also are amplified by the rise of machine intelligence. The reality is: we live in an economically polarized and cognitively polarized economy. Non-routine jobs are first to be reduced by automation brought on by machine intelligence; however, as noted here, non-routine jobs in diagnostic radiology will undergo shifts in the ways of wage earning, image analysis, and machine-radiologist collaboration.5 The radiologist and radiology department will change, more images and pathology will be identified by more algorithms. Jobs that did not exist today will exist in five to ten years. Taking cues from other industries is helpful. In other industries from using ATMs in banking to using online shopping via Amazon, bank tellers and storefront retailers have shifted their skills, but such jobs have not disappeared. These shifts happened in less than a decade. Our timeline is greatly shorter than this. Administrators and Technologists are differently impacted by coming automation. Administrators can prepare by focusing on one of the key linkages in data science: business-data alignments. Radiology business leadership (where most financial and resource-driven decisions are made) and IT (where most computerized data is analyzed and resourced) are often siloed organizational areas of expertise and may not share a common language of setting priorities for radiology service. One of the revolutions of machine learning has been the expansive online course offerings outside of expensive academic settings. Radiology administrators should leverage these tools, courses, and online accreditation processes. They arm administrators new appreciation of data science, leveraging data for clinical gain, leveraging data for financial gain, and understanding coding procedures. Technologists are differently impacted by coming automation due to their hands-on patient contact and patient safety Although these areas of direct patient care do stand to do well in the come years, technologists are uniquely positioned to expand their radiology service reach to a deeper focus on data flows, imaging workflow and the automation of radiology protocols, and improved pre and post image processing. Radiology exists within larger socio-economic change. As a medical specialty it is not special nor will be spared in terms of the impact of machine intelligence. This series has attempted to position radiology (or reposition radiology) into a wider technical-clinical and economic context in which it belongs. Questions remain that underlie AI’s potential to usher in a jobless future and may indicate change often not acknowledged. What is happening today to the way we represent and manage care when human-centered diagnostic expertise is perceived as temporary, a transition to a greater machine intelligence to come? What kinds of radiology service jobs and expertise are beginning to lose value today, not tomorrow? How do we plan for and deal with job and wealth polarization within our own field? What forms of knowledge, data, gender roles and professional adaptation are being considered useful in diagnostic radiology with a horizon of AI before us? Schwab K. “The Fourth Industrial Revolution.” Crown Business. 2017. World Economic Forum. “The Future of Jobs.” January 2016. Available at: http://www3.weforum.org/docs/WEF_FOJ_Executive_Summary_Jobs.pdf. Accessed April 10, 2017. Pearson D. “Radiologist: One of the best jobs in America.” Health Imaging. January 9, 2017. Available at: http://www.healthimaging.com/topics/healthcare-economics/radiologist-one-best-jobs-america. Accessed April 10, 2017. Dvorkin “Jobs Involving Routine Tasks Aren’t Growing.” Federal Reserve Bank of St. Louis. January 4, 2016. Available at: https://www.stlouisfed.org/on-the-economy/2016/january/jobs-involving-routine-tasks-arent-growing. Accessed April 10, 2017. Siegel E. “Peeringinto the Future through the Looking Glass of Artificial” SIIM Annual Meeting June 29-July 1, 2016. Portland, Oregon. Available at: http://c.ymcdn.com/sites/siim.org/resource/resmgr/siim2016/presentation/SIIM16_ClosingGS_Siegel.pdf. Accessed April 10, 2017. Raj Chety David Grusky, Maximillian Hell et al. “The Fading American Dream: Trends in Absolute Income Mobility Since 1940.” The National Bureau of Economic Research. NBER Working Paper No. 22910. December 2016.